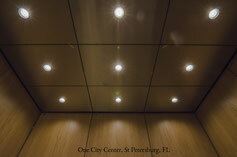 Your elevator ceiling supplies the lighting for your cab interior, and provides a removable escape hatch. There are a variety of options to consider for lighting and configuration of elevator ceilings. Energy and heat efficiency are of high consideration with elevator lighting. LED lighting is, we believe, the only wise choice in cab lighting. 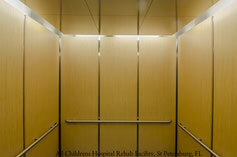 Even if you decide on a frame design, with 48" fluorescent lighting, there is an LED option there as well. We have the experience to guide you through the process of selecting what is right for your property. 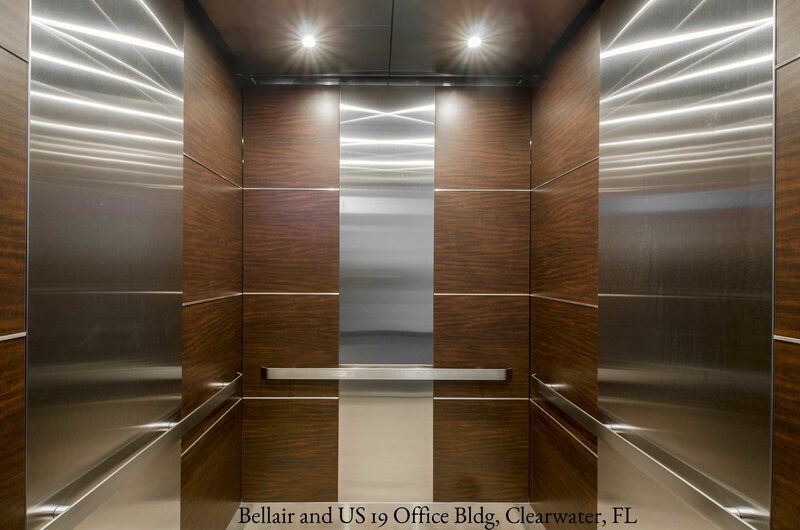 Cladding is the sheet metal work that's found on most elevator doors, headers, hoistway entrance frames, and inside the car normally on the car front. 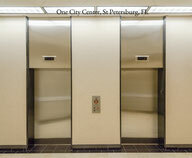 Most elevator cab companies that offer re-cladding services employ 20 gauge Stainless. This is fine if the surface you are cladding is very flat, which is most often NOT the case. The problem is, 20 gauge readily conforms to an uneven substrate which results in a wavy appearance. 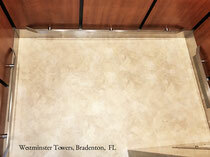 Unless it is specified by the customer, we insist on using 18 gauge Stainless on cladded surfaces. The look is immediately apparent between the two. Our 18 gauge cladding is not only flatter and straighter, but is far more resistant to dents and dings. After all, it's nearly twice as thick. 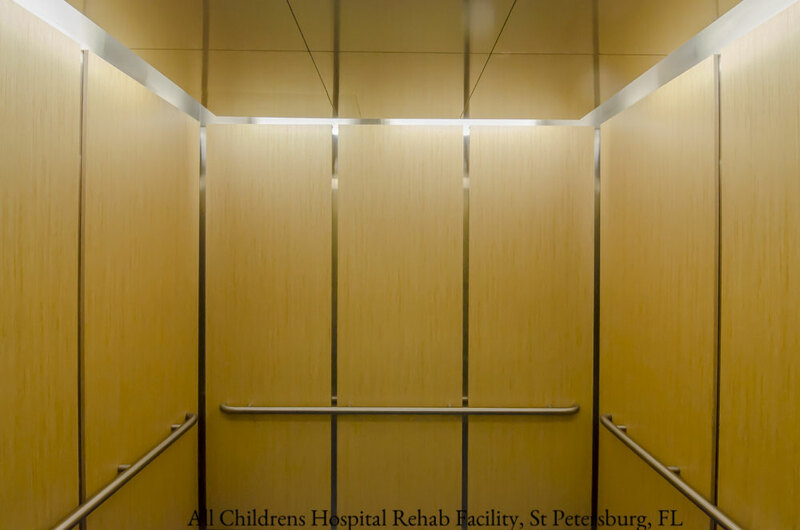 For high traffic areas we offer sheet metal products that have an extremely tough finish, that is highly resistant to scratching. These sheet metal products hide in plain sight in buildings in very high traffic areas where incidental damage is the expected norm. This is where the selection of finishes available to you becomes perhaps a little overwhelming. Especially when more than a couple individuals are involved in the selection process. 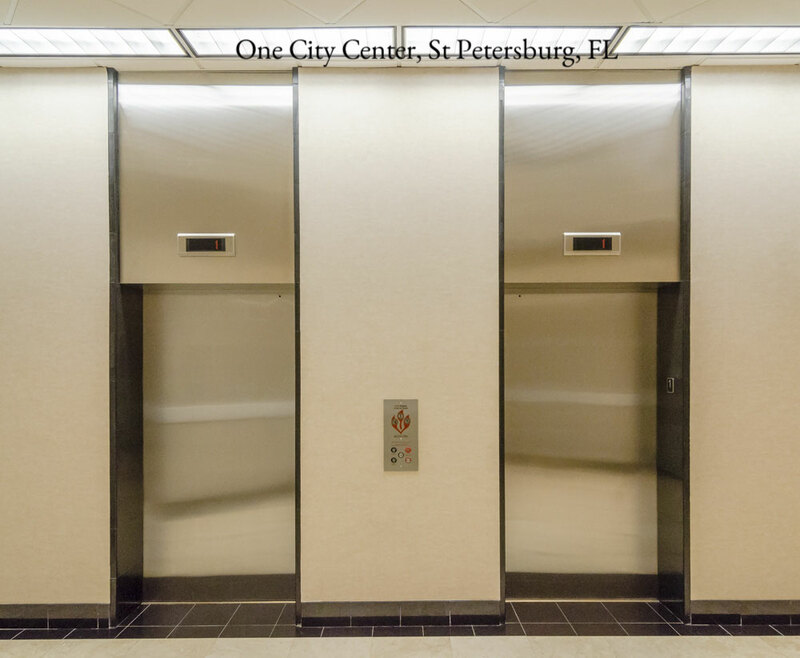 For office buildings, the more beautiful the better, and insist contractor and delivery personnel use a designated freight elevator to preserve the investment in your passenger elevators. 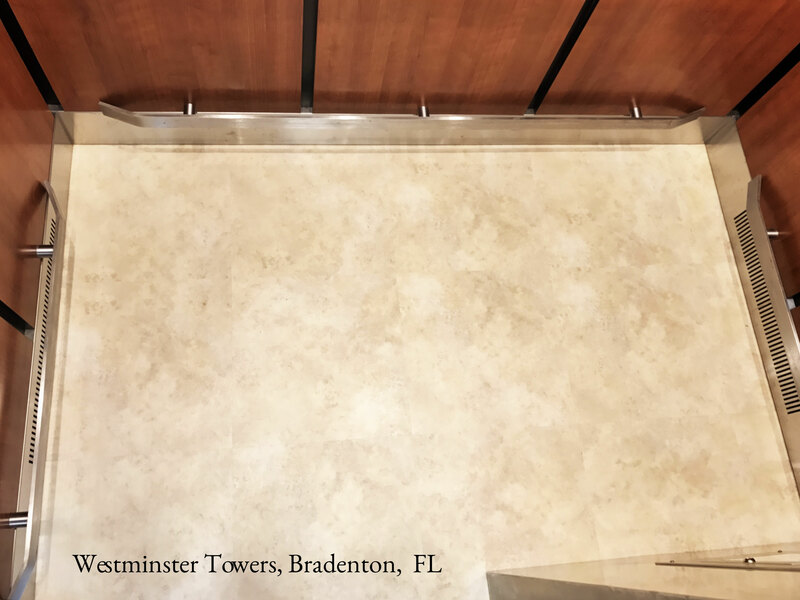 For hotels and properties with busy residential traffic we recommend using a combination of beauty and durability by employing the textured metal panels on the bottom to endure the occasional bumps and bruises that may otherwise occur with unprotected finishes. For general public use, go bomb proof and forget it. Certainly not at the bottom of the list is flooring. Thought should be given of course to coordinating with the finishes you're considering. Contrast is good here. We have a number of different flooring manufacturers from which to choose the perfect product and appearance. Important things to consider are, how will it stand up to the use your property sees day in and day out? Lot's of remodeling going on and contractors wheeling, skidding, and pivoting carts and dollies in and out? Easy to clean? Can I easily replace damaged tiles? Code compliant? Is this elevator exposed to the outside where water from rain or sprinklers can be tracked into the car? Is there a pool close by with possibility of wet passengers using the elevator?